Michigan has its first confirmed case this year of a polio-like illness called acute flaccid myelitis or AFM. The patient is a child in Wayne County. Nationally, there have been 134 cases of acute flaccid myelitis in 2018. 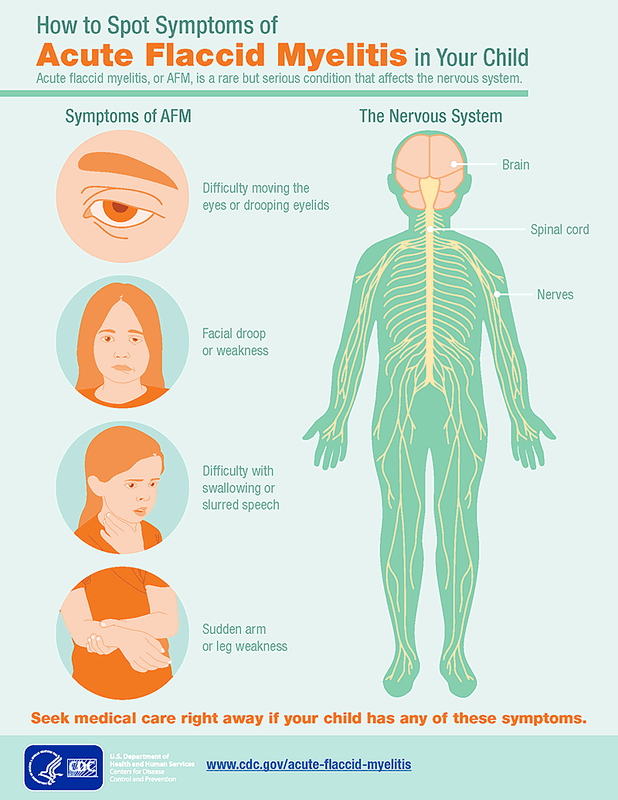 AFM can cause muscle weakness, facial drooping and paralysis. Most of those affected have been children. "This is incredibly rare," Sutfin emphasizes. "This is the only case we've had diagnosed and confirmed in Michigan this year. Just definitely keep an eye out; ask your health care provider if you're concerned, but we definitely don't want anyone panicking." The Centers for Disease Control and Prevention says most of the patients with AFM (more than 90%) had a mild respiratory illness or fever consistent with a viral infection such as enterovirus before they developed AFM. AFM itself is not contagious. The CDC recommends regular vaccinations, avoiding mosquito bites, and handwashing as preventive measures.